VOLGOGRAD, Russia (AP) For once, there’s little hype surrounding England at the World Cup. Come to think of it, how could there be given England hasn’t won a World Cup match for nearly eight years? But there’s a building sense of optimism that this young England team could produce some impressive performances in Russia, starting Monday against Tunisia in their opening Group G encounter in Volgograd. The team has won plaudits for its positive approach in the warmup games and there’s widespread respect for coach Gareth Southgate. That was evident in the low-key way he went about picking his squad. Southgate has made it a priority of winning back the hearts and minds of the country during his time in the job. Southgate has also sought to fundamentally alter the dynamic with the media in hopes it will alleviate the pressure on his team and translate into fearless performances. Less prickly and reserved, the England players have been open and relaxed at their training camp in Repino, outside St. Petersburg. Having a laugh and a giggle hasn’t been something that England teams have been known for over the past decade or so, when heavily hyped teams have failed to make much progress in any of the international tournaments they have played. Since the 2010 World Cup when the ”golden generation” of players – that included Steven Gerrard and Wayne Rooney – crashed out to a free-flowing Germany in the round of 16, England’s team has gone awry. A quarterfinal loss to Italy on penalties in the 2012 European Championship was followed by a draw and two defeats in the 2014 World Cup in Brazil. Worse was to come in the 2016 European Championship in France when another over-hyped team humiliatingly lost 2-1 to tiny Iceland in the round of 16. With the benefit of hindsight, perhaps that defeat will work out for the best for England team as it surely was the moment the country – and the media – realized the pressure heaped on the players was counter-productive. Though teams of the recent past may have had more high-profile names, Southgate has potentially more options at his disposal. The squad, one of the youngest in Russia, is versatile, meaning Southgate can adjust the way his team plays. Against Tunisia he’s likely to play with three at the back – John Stones, Kyle Walker and Harry Maguire – and another line of three, including two wing-backs, in front. It’s the four furthest forward that has excited fans. Harry Kane, who has yet to score in tournament football, will spearhead the attack, that’s clear. 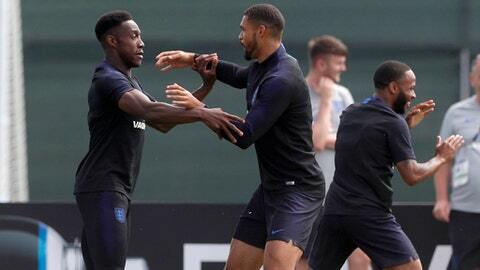 What’s more interesting is the combination Southgate opts for around the striker – three from Jesse Lingard, Dele Alli, Raheem Sterling and Marcus Rashford. Whatever Southgate decides, that trident will be primed to sow confusion among the Tunisian ranks. That attack is why England is widely expected to beat Tunisia, just as it did almost 20 years ago when the teams played their first group match in the World Cup in France. Another victory would no doubt be greeted positively, paving the way for England to quickly make it out of Group G if it then beats Panama. The expectation is that England’s final group match against Belgium will be the main event and determine which side comes out on top. Tunisia, back in the World Cup after 12 years, has a lot to prove too. The team, after all, blazed a trail in 1978 by becoming the first team from Africa to win a match at the World Cup. In its three tournaments since, it has yet to notch a second. Though England is the favorite, Tunisia is likely to present a challenge, especially if conditions remain hot and muggy. Under Nabil Maaloul, Tunisia is well-organized, particularly in defense. Spain can bear witness to that, requiring a late winner in their final friendly game before the World Cup. The team may have lost arguably its best creative player, Youssef Msakni, to injury, but it has others who can trouble England. Fit-again forward Wahbi Khazri, who has turned in strong performances for French side Rennes, and left-back Ali Maaloul are players to watch.